The bulls had indeed set out their stall and yes, indeed, they did get a “head of steam up”. 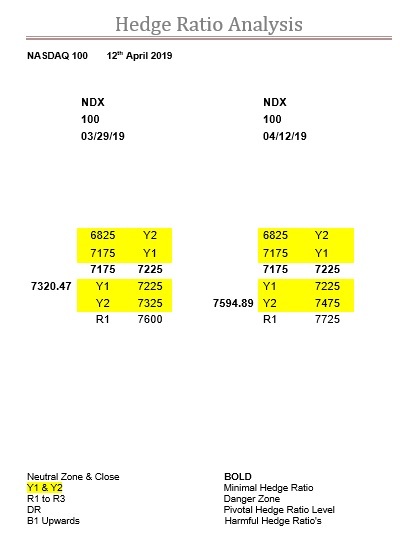 Actually, and on the very day we published last, as you can see the previous close was 7320.47 from the left-hand column in the table above, but that Friday the market gapped up at the open to 7377.77. But the real defining moment was when it came back down to Y2, with the intraday low of 7333.17, and the fact it bounced off Y2 meant the bulls really were back in the saddle. Of course, we don’t know exactly when R1 slipped from 7600, but we suspect it was only recently as the intraday highs from the 3rd all the way through to Tue 9th of 7589.69, 7571.13, 7581.90, 7602.08 and 7596.75 suggest it didn’t give way until Wednesday. All very punchy, but what we said above, back on the 29th March, is just as relevant today; “and the ratios are still seriously underdeveloped….. and with the lack of ratio meaning a general lack of interest, that may not be so easy in itself”. The only difference this time round is that next week it is the rollover and the expiry, so time is very short indeed, and as it’s a long weekend quite a few will probably get going early. At the end of the day, there is still so little ratio about the zone will move northwards no doubt, and substantially so, but nevertheless this index should be seeking the Y1 ratio bandwidth, at least, by the rollover.